For the next part of our home tour I wanted to share our main living areas, the living room and kitchen. This is the area in our home that gets the most traffic by far, and they are both very closely connected, because of our homes completely open floor plan. If you've been following along on our home tour this month then you know that our house was previously styled in a much darker, Tuscan-type look. By simply changing (mostly) paint and adding new decor, we've transitioned into a considerably lighter, happier, airier feel. Listed below are all the ways that we accomplished this look in our main space. 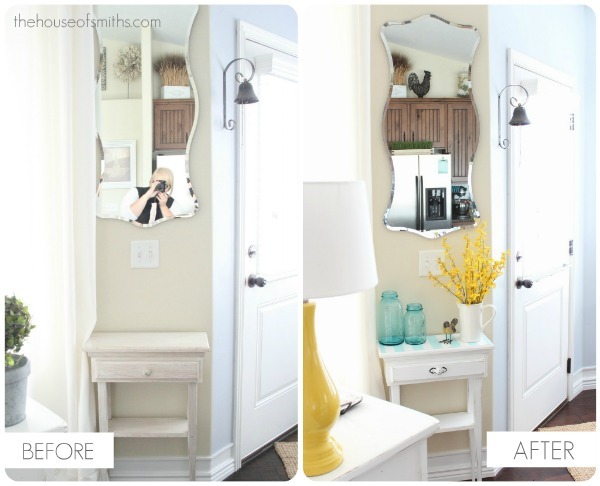 Our kitchen nook received quite the makeover as well! 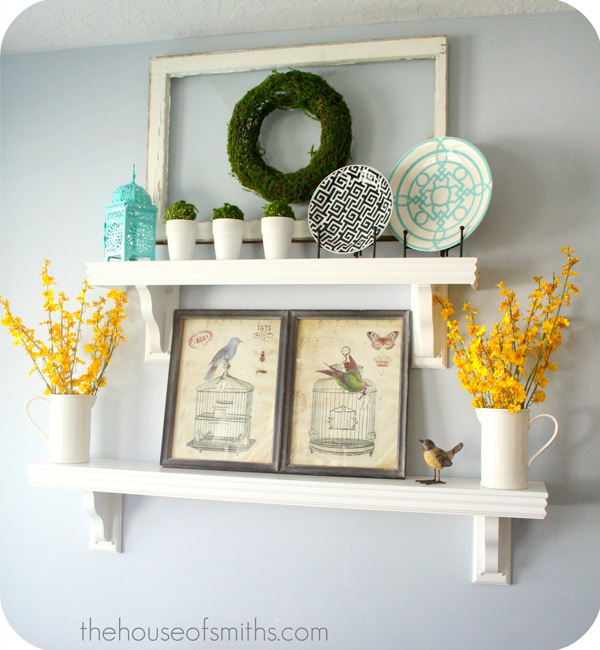 With the addition of the beautiful blue-gray paint (Upward by Sherwin Williams) and these simple DIY decorative shelves, we've been able to customize this space from holiday to holiday and season to season! 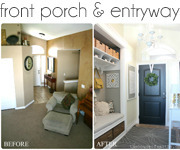 One of our most favorite projects in this space would have to be our pantry makeover. This space is so much more beautiful and functional now! You can check out all the details in our post here, and more about our painted door here. If you're looking to change your homes overall style, remember...taking your space through an extensive style shift takes lots of time, patience and trial and error. It can be overwhelming, so like I mentioned before, try focusing on taking it one little space at a time. Doing this will help you stay sane during the process and allow for you to not be living in a constant "construction zone". Beautiful, fresh, and fun! I love to see your projects. You must never rest. It looks fantastic. 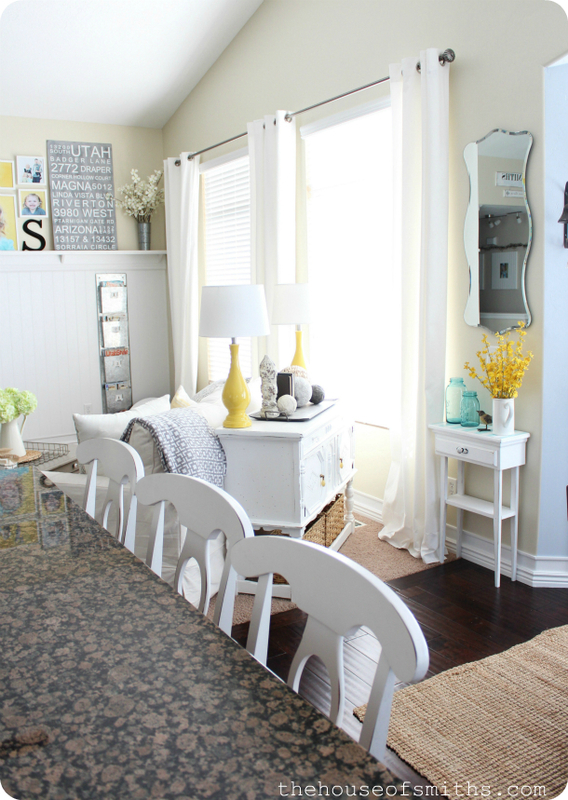 Do you like your black kitchen table? I'm thinking about getting mine painted black. Much cheaper than buying a new table set. I love light and fresh look! We've been transitioning our look from dark to light, also. It's a process! I absolutely love your pantry, too. Wow, it looks beautiful! So light and airy. Did you do the fake base board thing? I have been considering doing that because my baseboards are so dinky. Are you happy with it? Looks amazing! So much brighter and cheerful! Love the picture wall :-) You have a beautiful family. Oh my goodness I love everything about this!! The yellow and blue are amazing accent colors!! LOVE!!!! Can you tell me where you found the dinner bell by your back door? I am in love with that!!!! It all looks beautiful. You did a great job. Looks like you use your space well. Love the picture wall. Absolutely beautiful! 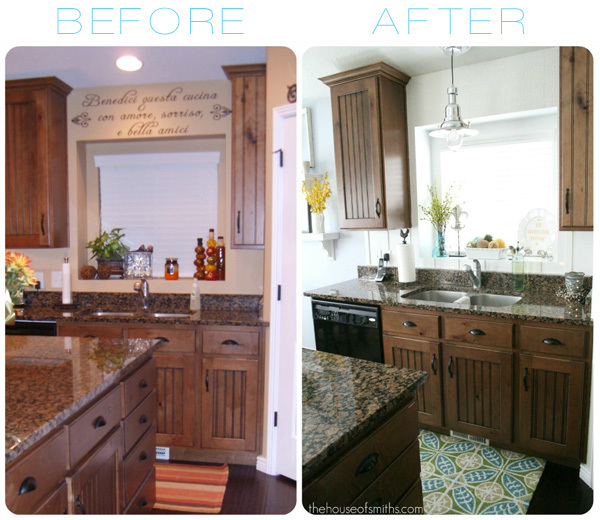 I love your color choices and the mix of painted furniture with the dark wood cabinets and floor. You guys have done such a beautiful job!! I love the new look... fit's my tastes perfectly!! Gorgeous and totally inspiring. Thanks for sharing! Love love love the makeover! It does look a lot more bright and airy! Question: where did you get that teeny tiny little table with the mason jars on it? I am looking for something about that size for my stairway! Fantabulous decorating Shelly and Cason! Thank you so much for sharing your creative palace with us. Love it! such beautiful transformations. 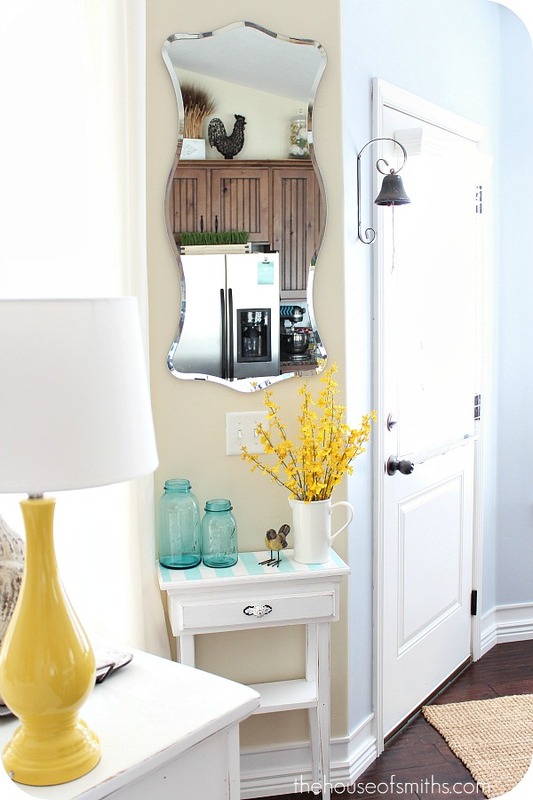 Every decor change seems to bring in and emphasize the light, and light is always in style! Thank you for the inspiration Shelley, in every sense that is - not only decor. Wow -- so pretty -- love it! I love seeing how you brightened up all of the dark finishes. We have dark cherry cabinets and that same granite. I figured I was stuck with a cozy, but dark kitchen. Not any more! so fabulous!! and definitely light and airy...but so cozy too. That's a tricky combo. I love all the family photos, up high, big and large scale, bright and cheerful. Fantastic. It's amazing to me that that is even the same house!! You guys have done such a great job. I am currently working on making my house more lighter and airier too and your color combos are exactly my taste:) Love it all! Wow, I just have to say your house was just as beautiful before as it is now. You certainly do know how to decorate! I am in love! This so beautiful. So bright and cheerful. Well done! looks great! it's awesome you're right what a little change of paint can do to start! Wonderful and cheery. Makes me smile. I love how you lightened and brightened everything..really beautiful! Was there a new farmhouse sink going in? Lovely. Lots of love and work went into this! Well done. Love your makeovers. 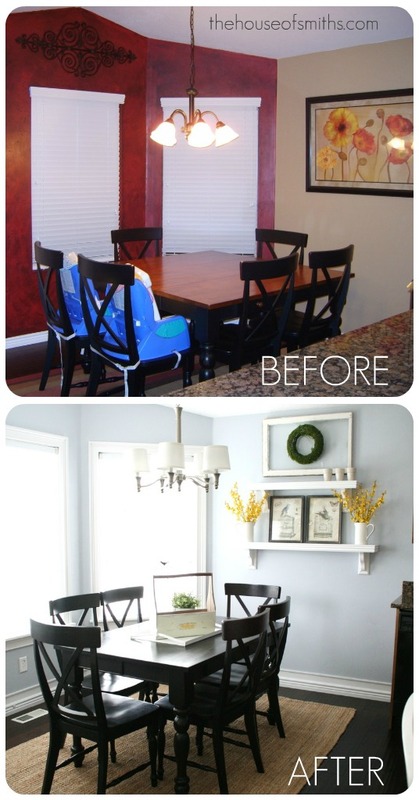 To me, the most dramatic change was the dining room. So much lighter and brighter. You've got great style! Your house is so beautiful! My husband and I are working on buying our first home, and looking at your photos is so inspirational in the decorating department! Thank you for sharing. You are so talented! Looks amazing, thanks for sharing. it looks even more fabulous than fabulous!! i love love love it...i'm on my 3rd read!! you thought of everything!!! Where did you get the wallpaper for the pantry?? LOVE! I love your style! Where did you get your cute utensil holder that is next to your oven??? I need to add pattern and texture to my kitchen. What a wonderful transformation. I love that you didn't paint your kitchen cabinets white. So many people have done that and it's...... but the wall color so lightened everything up. I think one of my absolute favorite things you did is paint the pantry door - I love that. Thanks for all your inspiration. beautiful!! where did you get the yellow pillows on your sofa? I love the changes you have made to the house. The lighter and brighter look is so great. I think your photography skills have improved too. I love how you updated your home. So light and bright. Did you plan out your outfits in your family photos to match your home decor or the other way around? Oh and how much dusting you must do! I would love my home to have a all those darling focal points but am so anti house work that I just settle for empty side tables. Picture perfect. I love how updated your home looks. Beige is so early 2000's lol. Did you plan your family photos outfits to go with your decor or was it the other way around? How much dusting must you do!! I am so anti house work I mostly leave my side tables empty. But I love how put together every little nook in your home looks. Just beautiful. Everything is gorgeous!!! 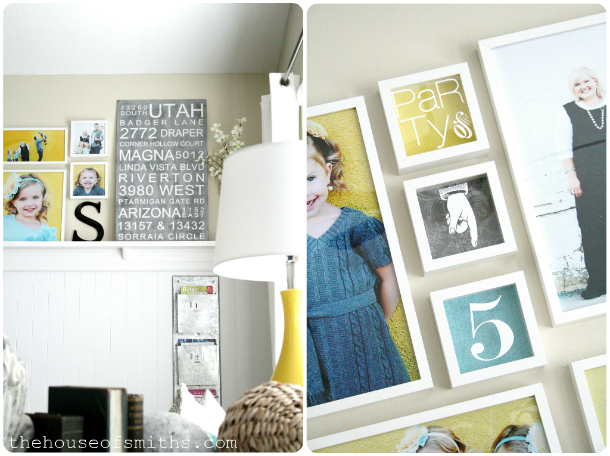 I absolutely love your photo wall in the living room! It's amazing a difference there is simply by painting the rooms a lighter colour! Absolutely beautiful! I really adore the yellow lamp and family photographs. I just love the colors you have chosen. 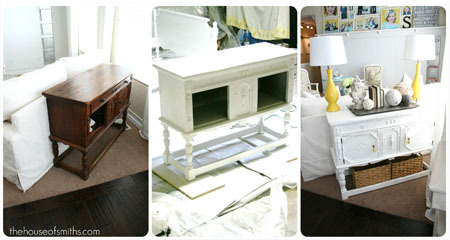 I wish I could talk my husband into repainting. Beautiful!! Love the white bookshelf with the drawer in the corner. Would you mind sharing where you found that, my daughters room has little space for book shelves but this would fit the bill! They really did well with the kitchen remodel project on that first photo. I like the after look. Apart from the open floor design , I love how light and airy it looks. Gorgeous! I'm struggling with changing away from so much black, and lighten up as you did, but it's still hard to make that jump! You inspire me to go for it though! Love the living room off the kitchen!! Gorgeous!! Love the lighter look! Very inspiring! I have my house in darker colors like you did, and am working on lightening it all up! Thank you for sharing! I love the living room off the kitchen after! curious about the Magazine holder. I have 4 children and use clipboards to manage their homework and school papers. Would like something more sturdy and not so office looking. This may sound crazy, but I had these colors in my mind, and a vision I could not fit all together, and now Ive found it! Thanks for posting this, as now I know I can start the project and know I am not crazy in thinking it would all work well together :) I love it! I love your home! 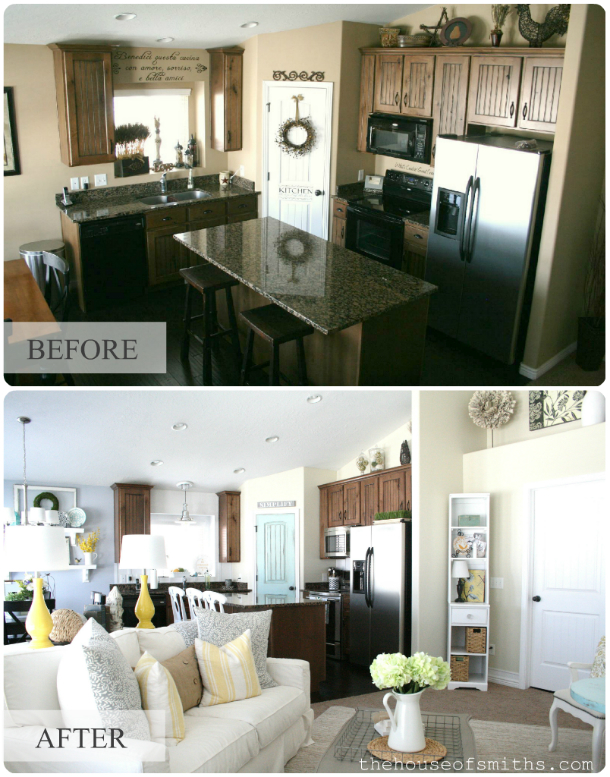 But I have to admit that the kitchen/living room transformation is my favorite! 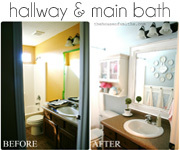 I think it is remarkable how much a change of paint color can lighten up the room. 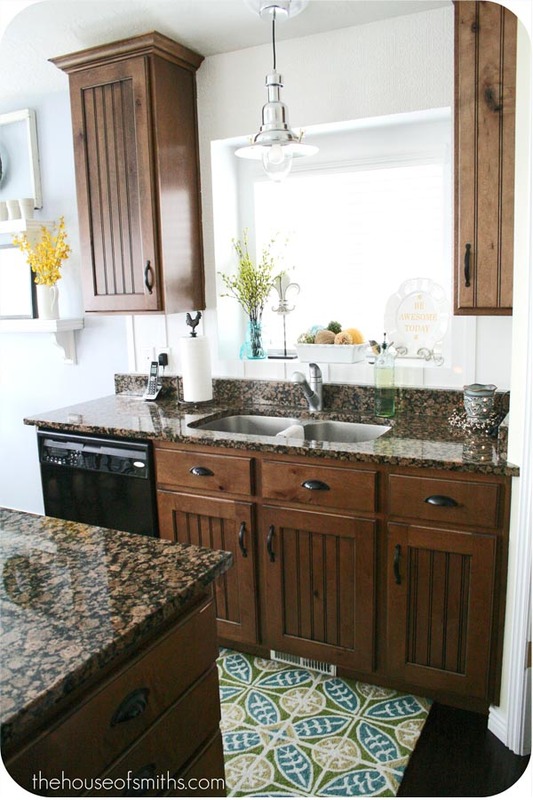 Your cabinets look almost as if they are stained darker, but it must be the paint. It's really awe inspiring to see how much your home has changed. You are my inspiration! Can you tell me where your dining room chairs are from? Hi I was wondering what type of blinds you used and where you got them? 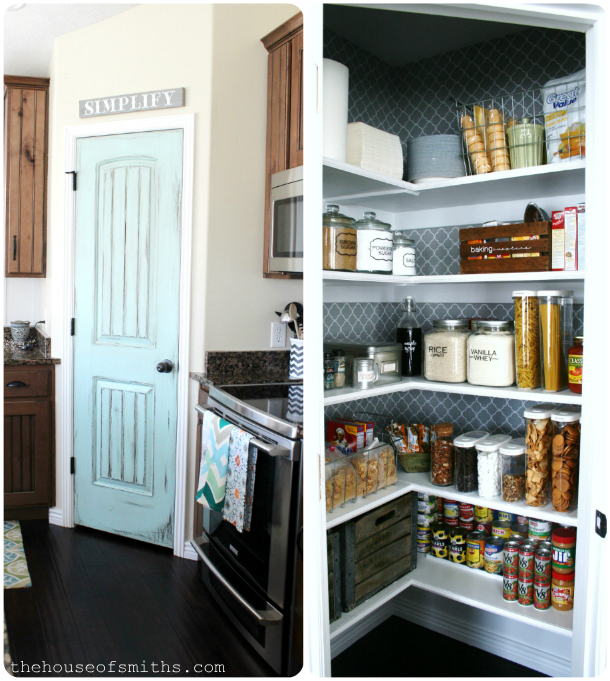 I loved your stenciled pantry. I have a cameo silhouette. I tried to cut a light plastic on it to create the stencil similar to the one you used in your pantry makeover. It would not cut through it. What am I doing wrong? Do they make a different blade for it? Thanks!! 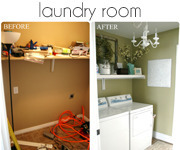 I loved your pantry make over. I have the cameo silhouette. It would not cut throgh the light plastic I tried. What is the secret? Thanks!! Im wondering what this years smoking hot colors are. Lime green maybe? Im moving into a smaller home and the kitchen counters are a dark green and Im not real crazy about them. I was hoping to use a color like maybe lime or pumpkin for accessories. The house is about a 1965ish with white marble tile, dark green counter tops and white cabinets. HELP!!!!!! Random question...I noticed that just off your living room is a door to the outside with a window in it. I can sort of see what looks like a molding box at the top. Is there a sheer privacy curtain on that window? Blinds? It's hard to see because it's so bright. I have a window like that on my back entry door and I don't know how to make it look pretty and not like a grandma curtain. LOL Ideas? 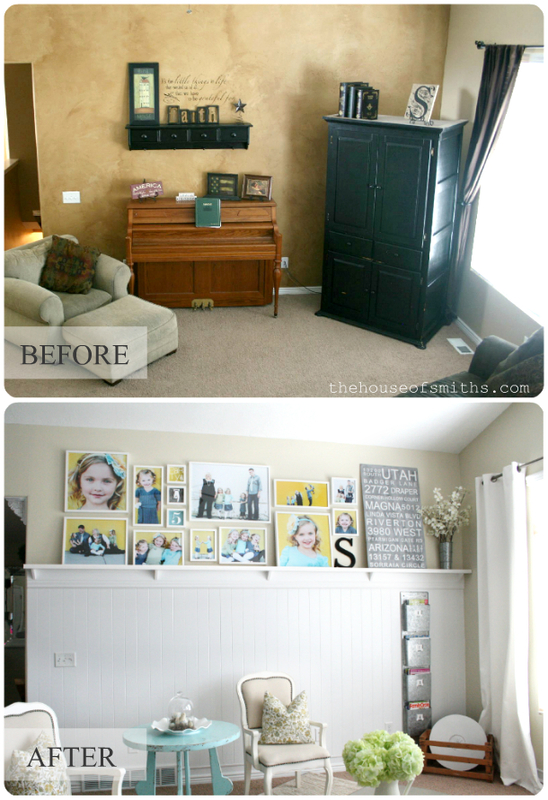 I had seen your blog before and always think about it every time I want to redecorate...which is every day. For some reason I never bookmarked the page and just looked through thousands of google pictures of DIY home blogs to find yours!! So HAPPY I found it!! Thanks for all of your awesomeness!